Easter is upon us which means a long weekend of crosswords, chocolate-stained rugs and trawling the internet to see which pubs are still open. 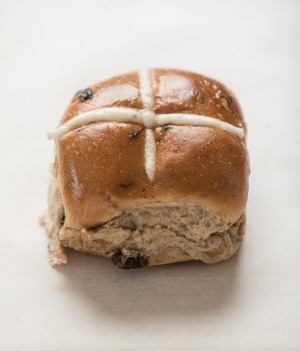 It also means four days of hot cross buns for breakfast, afternoon tea and potentially dessert. 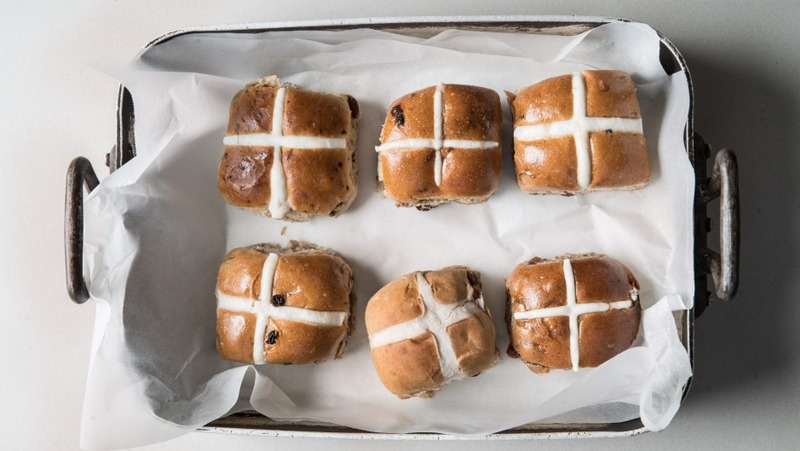 Hot cross buns have been on supermarket shelves since Boxing Day for reasons I suspect has a lot to do with marketing teams chasing free press. "Did you read that Woolies is stocking hot cross buns and it's not even two days after Christmas? How ridiculous. But I love them so I'm still going to buy them." 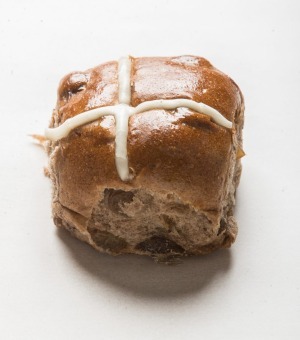 Hot cross buns are celebratory "sometimes" food, though. A festive riot of fruit and spice best reserved for Easter proper and served warm with enough butter to make a Frenchman blush. Artisan or homemade buns are best, of course, but sometimes that seasonal display stand at the supermarket is too convenient to ignore. 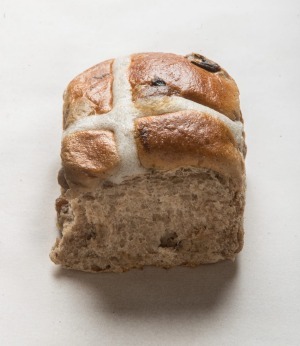 I also know many self-confessed "foodie" parents who relish hot cross bun season for its provision of cheap and simple school lunchbox snacks. 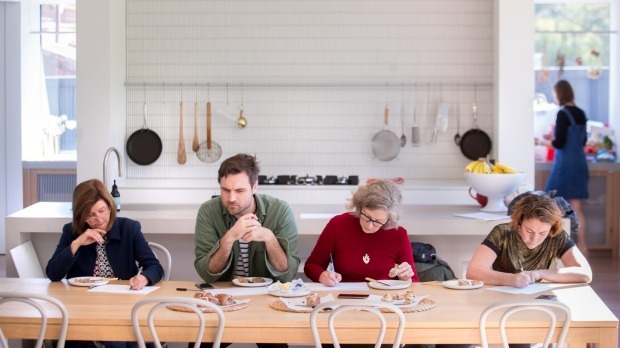 We assembled Good Food's biggest bun fans to put eight national brands to the test and offer guidance for which widely available HXBs are worth a roll this year. All buns were sourced on the morning of the tasting and warmed (not toasted) in a home oven. Lightly salted butter was on hand. 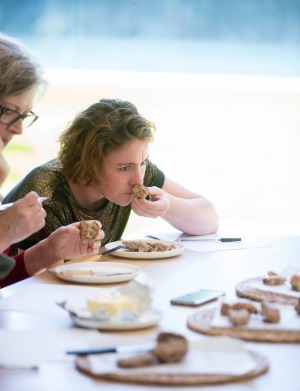 Although the buns were tasted blind, conversation was encouraged and buns were marked for flavour, texture, appearance and smell and the panel's points were combined for the total score. We only tasted traditional variety buns, too. No chocolate raspberry swirls or any of that malarky. Certainly no gluten-free. What makes a good bun? Freshness is key. You don't want something that was baked in October before spending six months in a warehouse freezer. 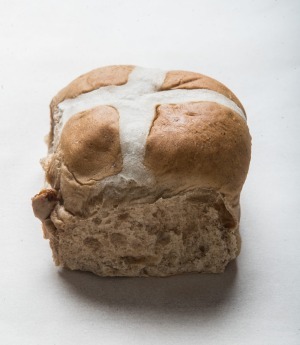 A good bun should have a spice aroma that lets you know it's Easter. Cinnamon, nutmeg, cloves and ginger are usual suspects. Texture should be soft and pillowy, with just the right amount of milky density to give you something to chew on and absorb that tub of butter you're going to need. Fruit – be it sultanas, raisins, currants or a cornucopia of all three – must be juicy and sweet. The inclusion of peel, however, is divisive. "Sometimes peel can be really dominant," says bun taster Roslyn Grundy. "The poorly made stuff almost reminds you of those discs you put in the dunny with a fake lemon smell – even though it's real lemon." Meanwhile, I'm a massive fan of peel and love the jammy citrus notes it can offer. As it happened, a bun fight was avoided as we didn't discover peel in any of the HXBs tasted. And for what makes a bad bun? Read on. CB: Very currant heavy with a couple of big boy sultanas for measure. I'd be happy to eat this one on Good Friday with a slab of butter or melted, but not too melted, cheddar. RG: This one smells quite attractive. There's a mix of spices, not just the one note. RC: It looks OK, too. There's plenty of fruit you can see on top and around the sides. CB: I was scared for a second when they hit the table thinking the currants were chocolate chips. RG: The actual cross isn't bad. Sometimes the cross is just a trail of wallpaper paste but this has a nice texture. There's a structural integrity to the rest of the bun too. It doesn't squish and collapse when you bite it. 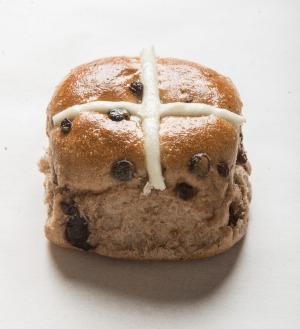 CB: I'll be interested to see if any of the buns rock a sweet cross* which I've heard can happen in America via cream cheese frosting. It's a ridiculous concept. 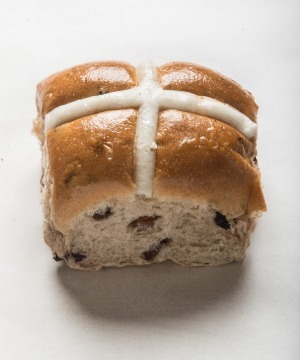 You actually want the cross to have a pinch of salt and counter the bun's sweetness. CB: I'm getting absolutely nothing on the nose with this one. No spice, no fruit. RC: Mine has a lovely gloss though, and a nice balanced taste and texture. I think this is my pick of the bunch. GC: There's a lot of flavour going on here and a delicate crackle to the glaze I'm liking. CB: It's quite sticky too, which is exactly what you're after. CB: Nice one. Look at the glaze on these little humdingers. If I was looking for a display bun to put in the centre of the table, these would be the ones. They also have that zippy spicy aroma you want in a hot cross bun. RG: They definitely smell fresh, they just don't taste very exciting. GC: There's a stale aftertaste to mine. And the fruit content is quite sparse. CB: The sultanas that are present are fat and juicy at least. RG: Oh, these are quite crisp and crusty to slice. RC: And so much fruit! Lots of currants and sultanas. RG: I like the shape of these. I feel they've been individually hand-rolled instead of put into a tray to rise up in squares. RC: They're really going for that rustic look, aren't they? CB: There's a properly shiny glaze and you can really smell the fruit. A lighter texture than everything we've tasted and the sultana dispersion is perfect. This is a fine bun. RG: There's not a lot of spice though. It almost feels like a bread roll. I half expect to find bits and pieces of multigrain throughout it. 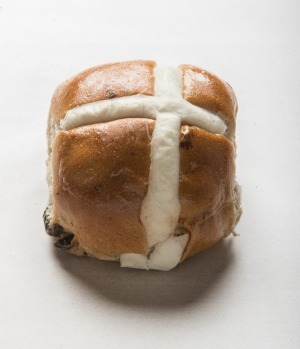 CB: Hot cross bun purists might be offended by this guy but if you're after a half decent sultana-studded bread roll for melted cheese, come on down I say. RC: Gee, there's not a lot of fruit in this one. CB: See, I have a lot of fruit in mine, but it's all contained to one big clump of sultanas. Fruit dispersion can make or break a bun. RG: It feels quite heavy to hold, this one. GC: I think something has been done to the fruit. It's like they've been soaked in whisky. It smells like a barrel-aged. CB: Some cheaper sultanas are doused in vegetable oil to quicken the drying process. That may have happened here. RG: There's almost an uncooked flavour to the dough. And the spice is quite dull. GC: It smells like the smack you get when you open a kitchen drawer full of ancient spice. CB: Too pale. Needs a better glaze. This reminds me of the supermarket buns I found in my primary school lunch box leading up to Easter every year. RC: The honey colour doesn't appeal to me at all. CB: There's a good amount of sultanas and currants, though. GC: Very bland. I'm getting a bit of old mace but that's it. RG: This one's designed for kids. I think you're right about the lunch box situation. 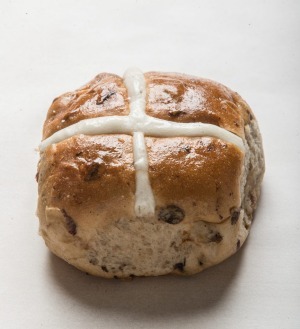 It's not a "let's sit around with our families and have a lovely hot cross bun" type bun. RC: The top's very disappointing. No crusty texture – it just sort of dissolves on you. RG: I feel this has been baked to a price, not a standard. CB: I'm getting a bit of ground ginger in the background – just the tiniest amount of heat. No kid's going to be upset with this one. I also don't think any grown-up is going to be excited about it either. CB: This smells like a vegetable stock cube. How odd. It doesn't look too bad though. RC: It's just a bit of a nothing bun. Not offensive, but quite bland. CB: A very good vessel for lots of butter I reckon. RC: There's very little fruit in mine. One currant and two sultanas. RG: There's not a lot of spice either. RC: Probably fine to heat up if there's a bunch of kids over at your house but that's about it. GC: They look like they've been kept in a basement. RG: There's a wrinkle on the skin that's quite unappetising. RC: Do we really have to taste these? The pale colour is awful. RG: There's no structural integrity – they're collapsing when I try to cut them. RC: There's barely any fruit. GC: I feel like I just smelt a Sharpie. CB: Kids will be huffing these behind the sheds at school. RC: I can hardly bring myself to eat it. Big fail.